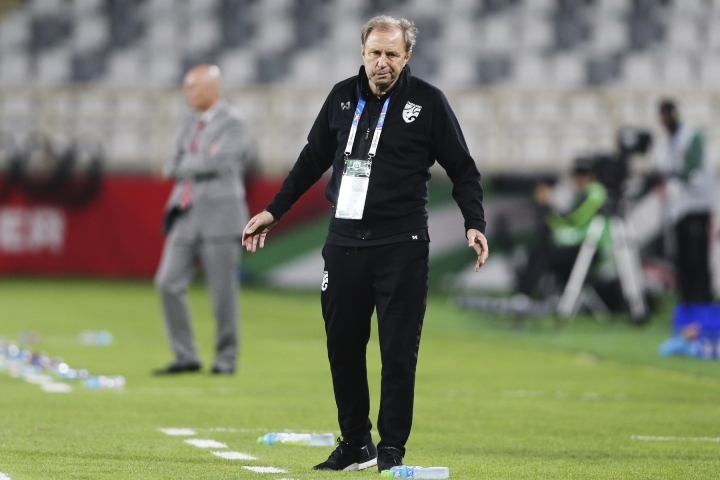 BANGKOK — The Football Association of Thailand has fired Milovan Rajevac as head coach after the national team's 4-1 opening loss to India at the Asian Cup. Thai FA president Somyot Poompanmoung had warned ahead of the continental tournament that Rajevac's job was on the line if he couldn't take the team to the second round. He announced the decision to fire Rajevac after Sunday's game in Abu Dhabi, despite Thailand still having group games against Bahrain and the United Arab Emirates to play. In a statement released early Monday he says, "It was not the playing format that Thai FA and the team supporters desired. I hereby announce the suspension of the contract with Milovan Rajevac as the coach of Thailand's national team." The 65-year-old Serbian was voted the African confederation's coach of the year in 2010 after guiding Ghana to the World Cup quarterfinals.